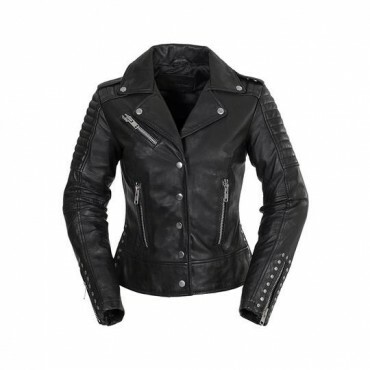 A classic rocker style jacket with feminine shoulder details. Available in oxblood, whiskey, and black. Style WBL1507 Details and Fit100% sheepskinClassic fitZip sleeveFully linedOne chest pocket and two hip pockets..
Carla | LM-1600 Coming Soon!Details and Fit100% sheepskinSlim fitZip sleevesFully linedThree hip pockets..
Dahlia | LM-3001WBLDetails and Fit100% sheepskinClassic fitZip sleeveFully linedOne chest pocket and two hip pockets.. The statement you've been waiting to make. This snap front, blazer look is complimented with quilted shoulders and studded sleeves. The side relief zippers and studs at the hips add to the industrial look of this jacket. Available in black. Style WBL1509 Details and Fit100% sheepskinClassic fitSnap and zip sleeveFully linedOne chest.. Favorite | LM-1025Details and Fit100% sheepskinClassic fitSnap sleeveFully linedOne chest pocket and two hip pockets..
Asymmetrically styled jacket with quilt detail on shoulders and arms. A single panel back keeps this jacket feeling clean and understated. Available in black. Style WBL1510 Details and Fit100% sheepskinClassic fitZip sleeveFully linedOne chest pocket and two hip pockets..
Pixi | LM-1071WBL Coming Soon!Details and Fit100% sheepskinCropped fitZip sleeveFully lined..
Princess | LM-1589WBLDetails and Fit100% sheepskinClassic fitZip sleeveFully linedThree outside pockets and two interior pockets..
Rockstar | LM-FIL-173CFDZ Details and Fit100% sheepskin (Black style - 100% cowhide)Classic fitZip sleeveFully linedThree outside zippered pockets and one snap down pocket..
Sandy | LM-1764WBLDetails and Fit100% sheepskinClassic fitZip sleeveFully linedThree snap down outside pockets, one zippered chest pocket..
Traci | LM-1087WBL Details and Fit100% sheepskinClassic fitSlash sleeveFull zip out linerTwo hip pockets, two chest pockets..